GOT A TRAFFIC TICKET IN NEW YORK OR NEW JERSEY? DO NOT PLEAD GUILTY AND DO NOT FIGHT IT ALONE! 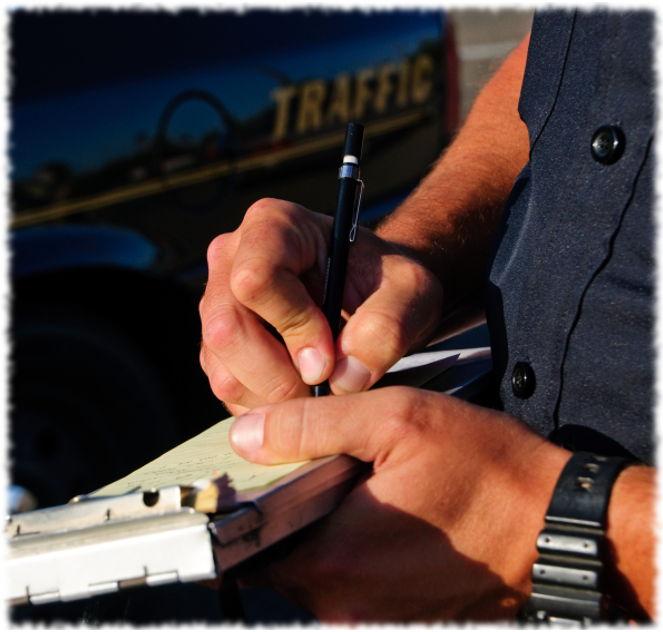 You have the right to an attorney during all proceedings involving traffic tickets. So, why not have the best ones by your side? Pleading guilty is always a possibility, but should you? Why not talk to a lawyer at Jeffrey Ziff and Associates, P.C. first? It’s a free consultation and we can help you to make the best decision possible. We fight hundreds of traffic tickets a week all across New York and New Jersey. You deserve to have the BEST traffic attorneys to get you the BEST results! Nobody fights harder for their clients rights and therefore NOBODY gives you a better chance to get your ticket DISMISSED! We have 35 years of experience defending people charged with violations. Come in for a FREE consultation. If you hire us, one initial fee will get you as many appearances as necessary to give you the best result. You could be charged with a crime. Sometimes a traffic ticket isn’t just about a fine. Charges, like the ones listed below, could lead to hefty fines, points on your license, probation and even jail time! No matter what, a conviction for one of the below will lead to a criminal record which could effect your future employment or immigration status. At Jeffrey Ziff and Associates, P.C. we have two experienced former prosecutors who know the ins and outs of the criminal justice system. We’ve handled both felonies and misdemeanors. Let us be at your side for the whole process up to and including a trial if necessary. EVEN DRIVING WITH A SUSPENDED REGISTRATION! YOU MUST BE REPRESENTED BY AN ATTORNEY AT ALL CRIMINAL PROCEEDINGS. So go with the best and most experienced, go with Jeffrey Ziff and Associates, P.C. How can I avoid going to court? In most cases traffic cases, our attorneys can represent you without your presence. If the Police Officer doesn’t show up does that automatically dismiss my case? No, just like you the officer has a chance to reschedule the date. The judge may dismiss your case based on the charge, your record and the history of the summons. The officer spelled my name wrong, does that automatically dismiss my case? Not necessarily. It helps your case that the officer made an error but this does not necessarily dismiss your ticket. If I have an out-of-state license, should I just pay the ticket and be done with it? No. In some instances points transfer from state to state. Also, if you obtain a summons in New York, you just began a New York record. Can you reduce the points on tickets? In the 5 boroughs of NYC there is no plea bargaining, meaning we cannot reduce the points and you pay a higher fine. In some cases a speeding ticket can be reduced, but not all. However, outside the five boroughs and in New Jersey, there is plea bargaining. If I don’t receive a letter from the DMV, the ticket is gone and I have nothing to worry about. Don’t just leave it alone! You’re license could get suspended and if you are stopped driving with a suspended license you may spend sometime in handcuffs and criminal court. Cell phone and seatbelt violations have no points, so I probably shouldn’t bother fighting them, right? FALSE! Your insurance rates can go up for cell phone and seatbelt convictions. If you just pay these summonses off you may be considered a persistent violator and a judge has the right to suspend your driving privileges. Shouldn’t I take the Defensive Drive Class after I’m guilty? No, The class is valid for 18 months BACKWARDS. So if you took the class January 1, 2010 the class would deduct 4 points from your record for any tickets received between 7/1/08 and 1/1/2010. If you are found not guilty, it will help your insurance rates. Should I just plead guilty to my insurance ticket to get rid of my headache? DO NOT PLEAD GUILTY TO AN INSURANCE TICKET! Your license will be revoked for one year and you will pay a $750 civil penalty on top of a fine. Hire help before it’s too late. I heard from my friend that the points on your license expire after 18 months, so shouldn’t I just keep rescheduling my case and I’ll be fine? That’s not completely true. If you get another ticket within the 18 month period after your initial ticket, then the points stay on your license until 18 months after your latest ticket and so on. Submit your traffic ticket to us using our app. Pay and view you case status updates all without having to visit the office in person. 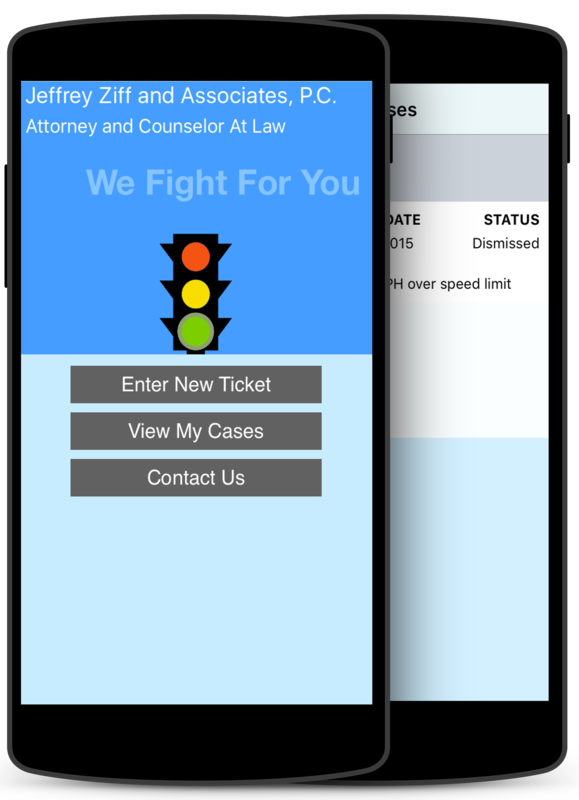 It's a quick and easy way to have your traffic tickets taken care of by our legal team. I have used Jeffrey Ziff during the course of 6 years. The results have always been positive. Police officers take advantage of you on the road. Mr. Ziff is there to protect you in court. I want to express thanks to you and your staff for fighting and winning my cell phone ticket in Brooklyn South. I appreciate the reminders I received in the mail and the patience in answering all my questions, no matter how absurd they were. In the spring of 2008 you represented me on a matter in Criminal Court. I want to thank you and your associate, Anthony Adinolfi for disposing of the case and saving my license. I will be sure to mention the great quality of service you provide to all my friends. Good luck and thank you. I want to extend my personal appreciation to you and your staff for your outstanding job in representing me on my traffic tickets. I am proud to recommend your firm to my family and friends. Thank you so much for representing me, regarding my traffic tickets. I found your staff to be very pleasant and efficient, always returning my phone calls and answering my questions. Your professional atmosphere is greatly appreciated. And I want to thank you for resolving my case in my favor.